Reuters reports that the Ways and Means Committee plans to include limits to the state and local taxes paid deductions as part of the tax code overhaul. “The deduction will be significantly curtailed or axed in any proposal put forward by Camp, said an aide who works for him,” according to the Reuters article. Disproportionately benefit high-income states and high-income taxpayers at the expense of low-income states and low-income taxpayers. 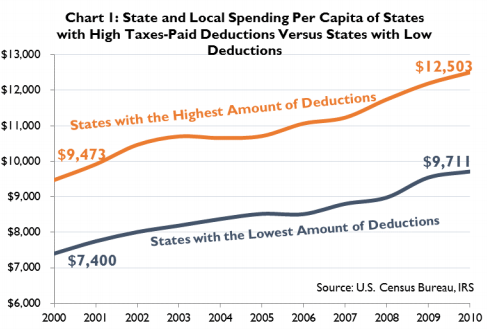 The chart below shows that states with the highest amount of taxes-paid deductions also have significantly higher levels of state and local government spending. In addition, 55 percent of the benefits from the state and local income, sales, and personal property tax deductions accrue to taxpayers with incomes above $200,000. Furthermore, our Taxes and Growth Model finds that if Congress were to eliminate all state and local provisions in the federal code and use the revenue to cut rates across the board we would see a $41.2 billion increase in GDP. More recently, we took a look at the economic effects of eliminating just the deduction for state and local income or general sales. We found that eliminating just this provision and using the revenue to cut taxes to maintain revenue neutrality would increase GDP by $24.4 billion and add the equivalent of 300,000 jobs.